By signing up for X9 Internet services or by using any other means of subscription including subscription via a third party, a sales representative or channel partner, you benefit from the present network and power uptime guarantee if you are billed directly by X9 Internet. Who may benefit from this guarantee? The following guarantee is applicable to the renewable services offered by X9 Internet which include a network connection and bandwidth. All customers of renewable services whose accounts are in order with no unpaid balances are eligible for the present guarantee. X9 Internet guarantees 99.9% network uptime for all customers who have ordered a service which requires a network connection. X9 Internet offers a 100% electrical power supply guarantee. Why do some hosts advertise 100% uptime? They keep their main corporate website on a cloud system or they run a master and slave server set-up, either which will continue serving their website when there is an outage or downtime. They then sign up with public monitoring providers who will show a 100% uptime. However, we view this as cheating, unless the hosting service they provide is also hosted on the same fail over backup system. But sadly that normally is not the case. X9 Internet keeps its corporate website on the same server network from which it supplies hosting service to its customers. 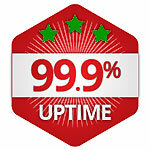 We have consistently maintained an uptime of 99.95% or higher over a period of each year. Another case where a host can boast 100% uptime is when they simply just don't do any maintenance on their servers whatsoever. And we all know how buggy and sluggish our PCs become over time when we don't occasionally find and remove the Trojans and Spyware applications which find themselves onto our PCs. To ensure that our servers perform trouble free, we occasionally update and upgrade applications and install security patches, and this requires a reboot. During such a reboot your website will become unavailable but you will not loose any email. A reboot only takes a few minutes and we normally do this work between the 0200 and 0400 GMT. And finally, some web hosts just lie about their uptime.